For Len and Betty Ann LaRocque, retirement was missing only one thing: the perfect home. For this reason, the couple spent nearly two years planning their retirement dream home on the shores of Rainy Lake in northwest Ontario. 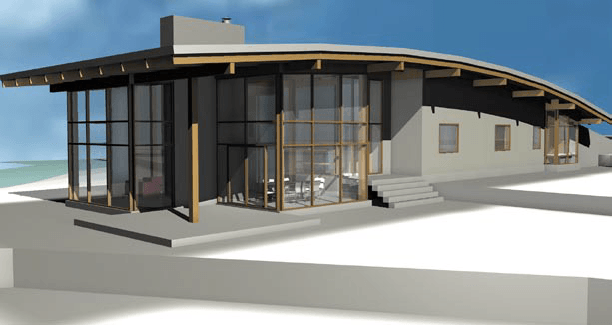 Energy efficient SIPs combined with contemporary design creating a dream home for their retirement. “We set out to build a house that had all the features we wanted,” said Len LaRocque. LaRocque contacted David Nelson, the Principle of Nelson Architecture, a design firm based in Kenora, Ontario. “The owners didn’t want a house that looked like another house,” said Nelson. “They had no preconceived notions, which allowed us to look at a lot of different options.” So, what options did Nelson choose? First, Nelson proposed a contemporary design with a low-sloped, curved roof that opened up to spectacular views of Rainy Lake. Then, he recommended using the Insulspan® Structural Insulated Panel (SIP) System for the walls and roof of the home. This was because energy efficient SIPs would create a high performing building envelope. Insulspan SIPs use a continuous layer of closed-cell rigid EPS insulation to cut down on thermal bridging and air infiltration. The LaRocque home uses energy efficient SIPs from Insulspan for walls with an effective R-Value of R-22 and an Insulspan SIP roof rated at R-29, giving the home much needed additional insulation and cutting the couple’s heating costs during cold Ontario winters. In addition to the energy-efficient SIPs that enclose their home, the LaRoques added high performance windows, low flow fixtures to reduce their water use, and a geothermal heat pump.